Snow has been falling at here for most of the last two days. 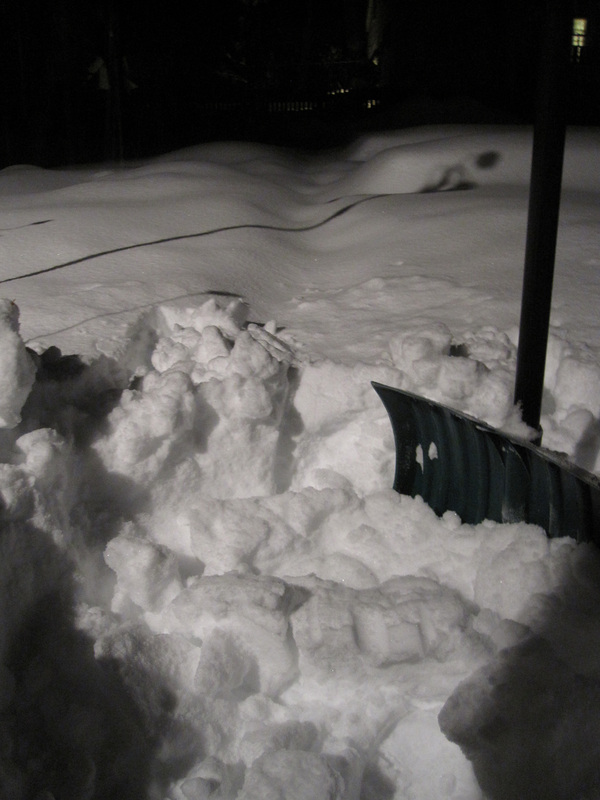 I like to turn on the floodlight at the end of the house and go shovel at night. When I look into the darkness, those little sparkly crystals are still falling. The neighbors’ houses are lit up and cozy-looking. My little house beckons warmly too. This is the same snowstorm that has brought Seattle to a halt. As I listened to the radio news this evening, the reporter had recorded his story while sliding on cross country skis in the city streets. Later I looked at a Seattle paper online to learn how much snow had actually fallen. Four to eight inches. More had fallen in the southwest part of Washington. No mention was made of any place east of the Cascades. Well, I suppose it’s not news that it snows here, especially in the mountains. I shoveled a path to the compost. The snow is about knee-deep, light and very cold. Easy shoveling. Skiing would be good. Earlier in the day, I’d thought about skiing from the back door. But the lure of the nest was too strong. I stood at the window, hypnotized by the magic of falling snow. Turned back to all my projects–clearing off the drawing table (this task never ends), actually drawing, making sourdough whole wheat biscuits to serve with soup to a friend for lunch, learning some new tricks in Photoshop, starting a batch of vanilla extract. Life is slow enough now to do those sorts of things. Life is slow enough to think, ponder, mull, ruminate, reflect, tinker, putter, relax. Life is calm enough to write some poetry. What will it take to get more of you to post a haiku? The haiku challenge is not about writing something good. It’s about writing, period. Let the images of your day ferment in the compost of your awareness and see what transforms into seventeen syllables of wonderment. I like nighttime snow(ing) photos, too. Enjoying your posts as always!